Since he always wore the appropriate color for St. Patrick's Day I want to belatedly note the passing of Van Williams -- the Green Hornet. He was 82 years old. Mr. Williams actually died on November 28th of last year from kidney failure. I knew of it at the time and meant to write about him but got no farther than storing an obituary link in a draft post, meaning to come back later and flesh it out. Life was a bit hectic at the time though and I never returned to it. But one thing I've always hated to see is lesser known celebrities being forgotten and fading away. Well actually, anybody fading away. One of my favorite pastimes when I'm editing Wikipedia is creating biographies of old bit players from the movies, especially the ones who had a taste of fame but never really attained it. It's a little like the ancient Egyptian belief: as long as your name lives on here, you live on in the afterlife. Van Williams was one of those hunky actors who emerged in the early 60s, like Troy Donahue and Tom Tryon. During that time he starred (with Troy Donahue!) in Surfside 6, about three super-cool Miami detectives frequently seen in swimming trunks, who solve crimes from the posh houseboat they live on. I've never seen the program but the theme song is quite memorable ("cha-cha-cha!"). 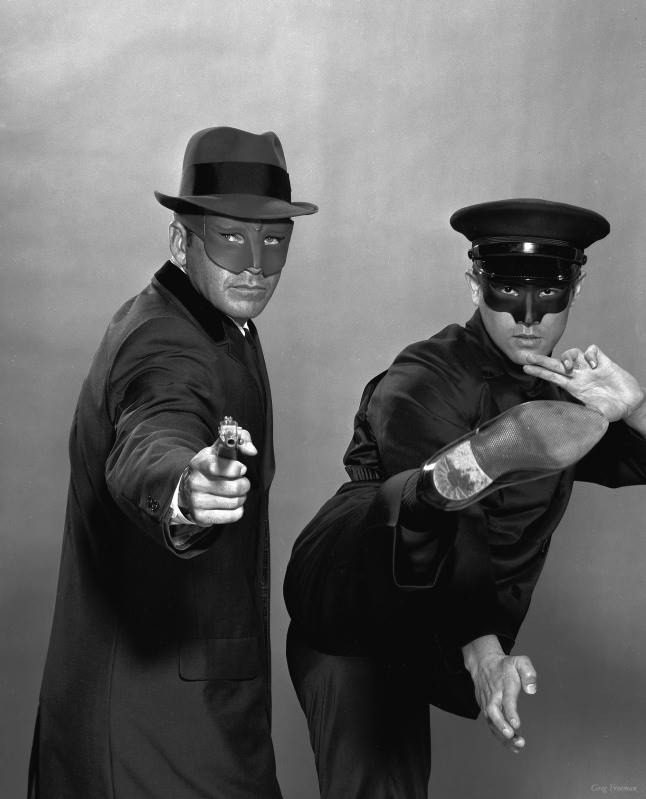 After that ended in 1962 he did guest shots on TV until 1966 when he landed his signature role as The Green Hornet. This I watched every episode of. It was from the same group that produced the campy but cool Batman, and the Hornet even made his debut in a two-part Batman episode ("A Piece of the Action/Batman's Satisfaction"), but his own series was played straight and I liked it better. Together with his trusted butler Kato (played by Bruce Lee, who went on to achieve godlike status in certain circles), the Green Hornet prowled the night in his weaponized, high tech, super-car Black Beauty searching for low life thugs and crime syndicates to be smashed. Aside from Kato's deadly kicks and chops the smashing was often done using the Green Hornet's weapon of choice: the "hornet sting," a sleek ultra-sonic gun that had the effectiveness of a laser beam. Unfortunately, The Green Hornet lasted only one season and unfortunately has been supplanted in most people's memories by a truly odious movie of the same name.